Share your sincere wishes with the happy couple in a well-worded greeting card. Many couples save their wedding greeting cards to enjoy for years to come. Writing a thoughtful wedding greeting doesn't have to be a hassle. Brainstorming some ideas and trying out your phrasing before penning your greeting on the wedding card will make the process much easier. With a little forethought and planning, you can be sure to write a wedding greeting that the newlywed couple will be sure to remember long after the big day. Compose your greeting on a sheet of scrap paper to avoid mussing the card. Brainstorm ideas about your wishes for the newlywed couple on their big day. When writing your wedding card, you may wish the bride and groom years of happiness together, luck, love, fun and adventure, or even wealth. 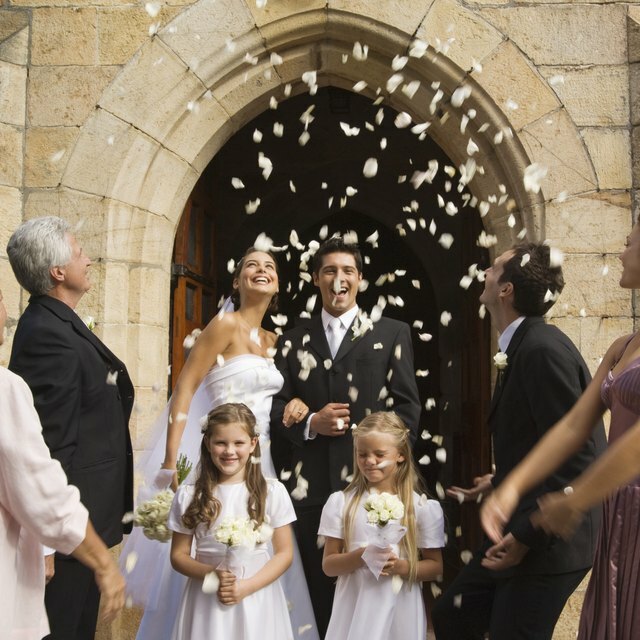 Narrow your list down to just a few main wedding wishes you feel are most important to the individual couple. Choose a few items and compose a personal message that fits your friends' personalities. Open with a salutation. For formal cards, "Dear Mike and Mary" is appropriate, while humorous cards may require a more casual greeting. Write several sentences detailing your hopes for their union, keeping your friends' personalities in mind. Sign off with an expression like "Love," "Warmly" or "Best Wishes," followed by your name. Edit your note to ensure it says exactly what you would like it to say. Once you are happy with the message, copy your final draft onto the greeting card. Take your time and use your best handwriting. Be sure your greeting is legible so the bride and groom can read and enjoy your message for years to come. You may also choose to add a short poem to your greeting for an added touch of romance.